This issue was to be Bhutan's contribution to the world wide omnibus issue honoring the UPU. 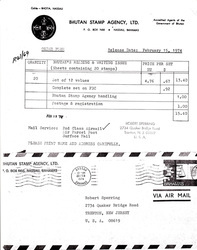 The original first day of issue was to have been February 15, 1974. It was finally officially issued almost 20 years later, on May 2, 1993. 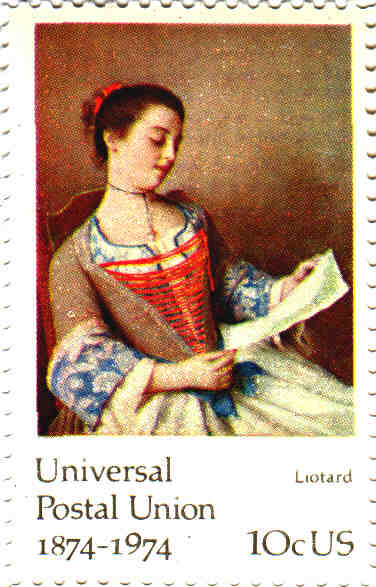 Many events related to these stamps occurred during those years. A joint design issue gone wrong. 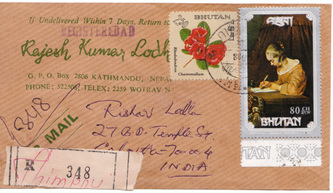 Until 1974, Burt Kerr Todd of Ligonier, Pennsylvania (USA) was Bhutan's Stamp Agent. He had operated the Bhutan Stamp Agency, Ltd., in the Bahamas from the days of Bhutan's first stamp issue in 1962, and had obtained the license as a result of his acquaintance with Bhutanese royalty. 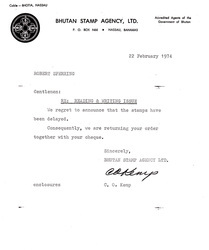 In 1974, the matured Bhutan P&T, under a new government, gave the contract to a new agent in New York (IGPC). Before the contract changed hands, Todd's company prepared this set of Art stamps to commemorate the 100th Anniversary of the Universal Postal Union (UPU). It was to parallel the USA issue of the period (See Scott US Nr. 1530-37 for similar designs incorporating fine art with a letter reading and writing theme). 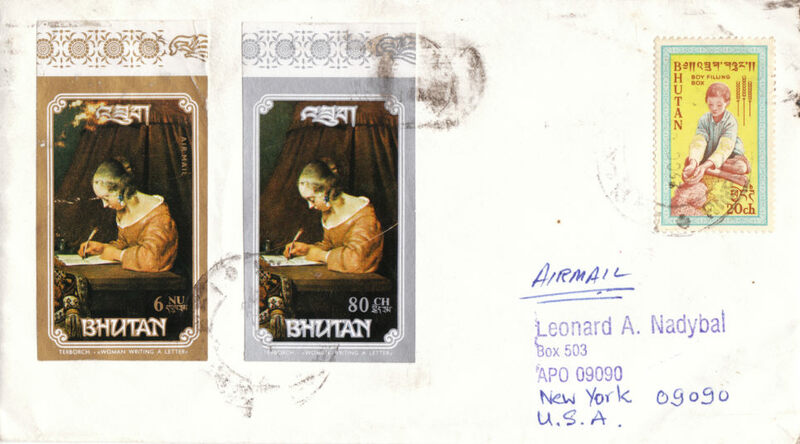 His agency distributed samples in new issue announcements that were always sent to the philatelic press, and prepared the usual shipment for the Bhutan post office. At that point, he lost the contract and the right to sell the stamps his firm had prepared. In the meantime, the sample stamps began to appear (even on covers) which fetched incredible sums whenever they appeared at auction, causing Michel to list and price them. Nr. 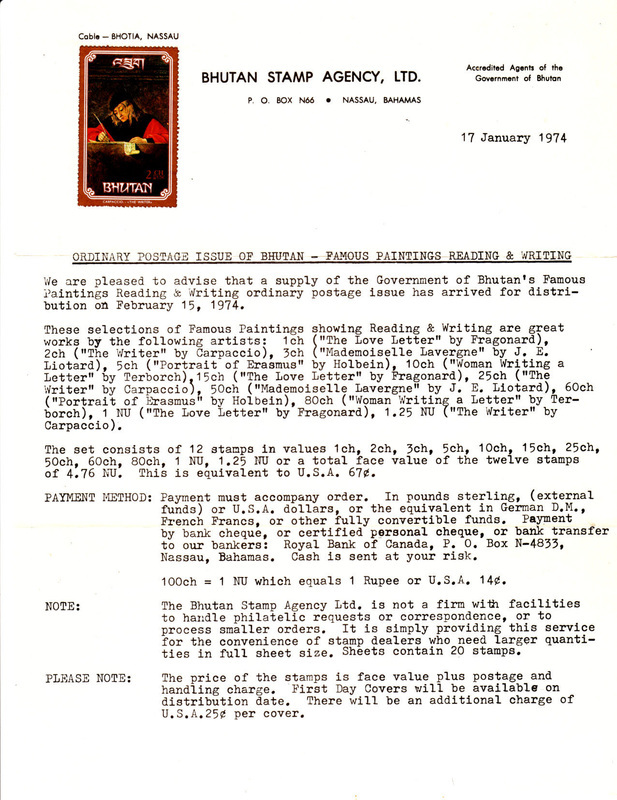 III-XIV were distributed only as samples to philatelic publishers, etc. Nr III-VI, CIII, IX, XI, XIII and XIV are also known imperforate. 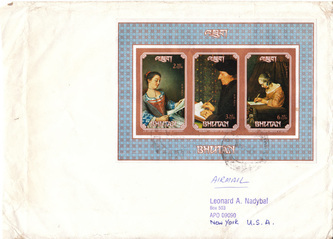 Additionally, imperforate 2Nu and 3Nu have been seen, as well as a souvenir sheet with values of 2Nu, 3Nu and 6Nu perforated and imperforated. 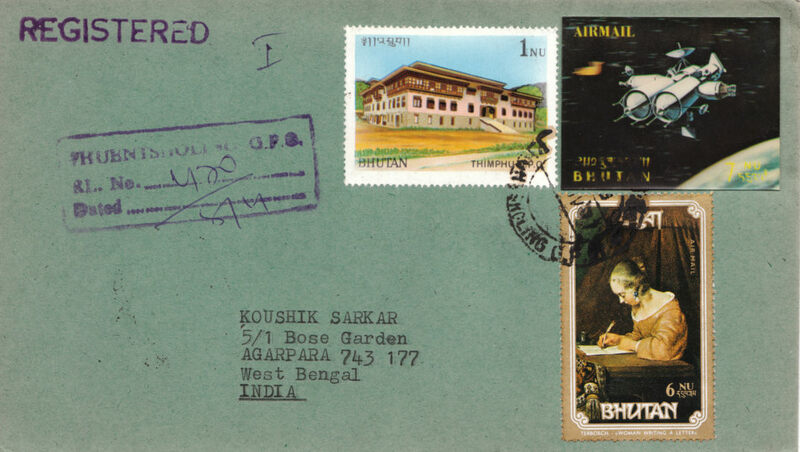 As a result of disorganization in Bhutan, the agency stock of these stamps that was sent from the Bahamas to Bhutan was never collected by the P&T from the customs office in the southern Bhutanese gateway town of Phuntsholing, where the philatelic agency was located at the time. In 1989, the government moved the philatelic agency to the capital, Thimphu, and realized it owned missing property that had been languishing in customs for years. 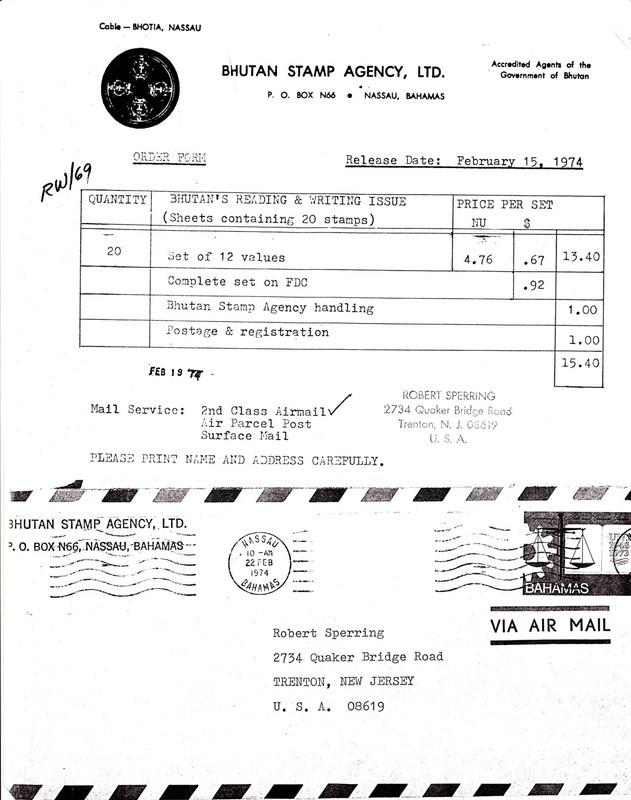 When postal officials went to take possession of the stamps, the customs office wanted the P&T to pay for the storage. The P&T refused and the dispute was on. Sometime in the late 1980s the 80ch value from this set began to appear in large quantities on the philatelic market through stamp dealers in Calcutta, India. The vast majority of the printed quantity of this value had been stolen, apparently from the customs office. Franked envelopes from collectors with copies of this stamp affixed began to arrive at the P&T, to be postmarked and returned through the mail. Most of these envelopes were sequestered for years in the office of the Director General of the P&T, because the post office knew they were stolen stamps that had never been officially issued. At about this time the publishers of Scott catalogs inserted a note in their listings showing these stamps were not issued. Scott continued to publish this note long after the stamps had been officially issued. In 1993, sources say, the P&T told the customs it should destroy the stamps, at which time the customs, realizing that destruction would involve additional work for no money, then just relinquished custody of the stamps without collecting any money for the 19 years of storage. At this juncture, the P&T then had to decide what to do with the stamps. 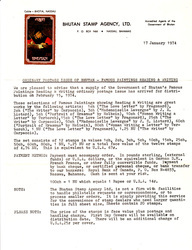 After consultation with one of it's contracted agents in Europe, who advised it to quietly release the stamps because of the stolen values and samples already in circulation, the P&T simply placed on sale what undamaged copies could be salvaged. Mint sets of the perforated versions of these stamps offered and sold after official issuance were usually missing the 80ch value due to their having been stolen years earlier. It is now the key denomination in this series. The first day of issue for this 1974 set was May 2nd, 1993 at the Thimphu GPO. 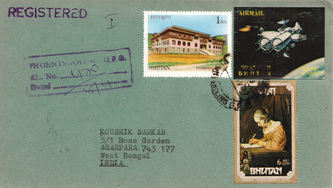 Ten sets of first day covers are known to have been prepared. They are illustrated elsewhere on pages of this website devoted to first day covers.